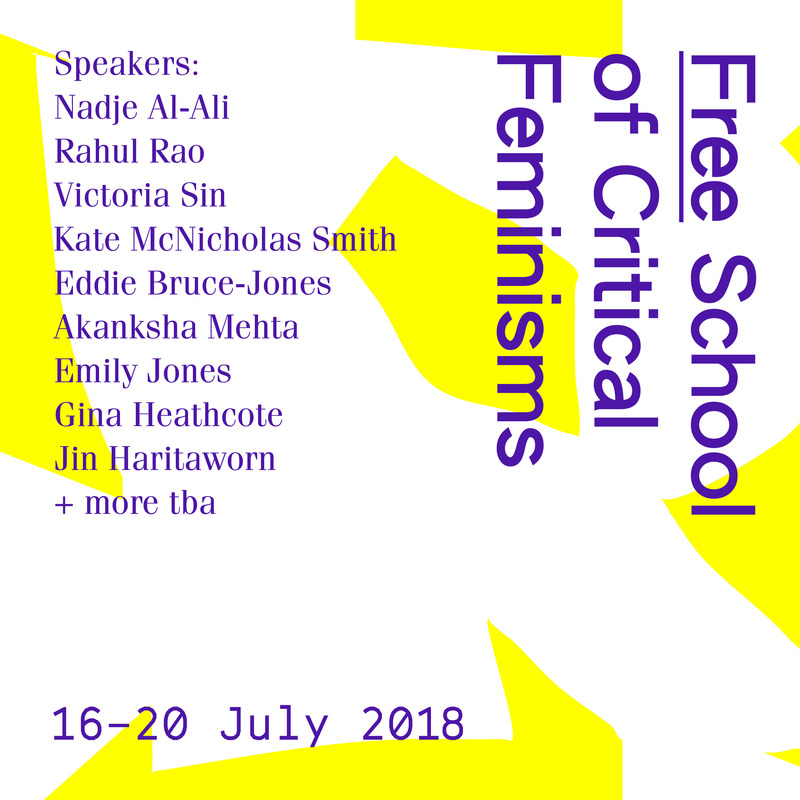 The London Free School of Critical Feminisms is a week-long course that will see 16 students come together in an intimate and supportive community of peers to explore questions of feminist theory outside the imperatives of institutionalised academia. The School will charge no fees whatsoever, with the aim of removing the economic barriers that often accompany events of this nature – barriers that affect women, queer and trans people of colour in particular. We understand that removing the formal cost of participation is only one step towards accessibility. Besides offering help with finding accommodation, organising child care for speakers and participants, we also provide free lunches throughout the week. The week will be held from 16th to 20th July 2018 at SOAS, University of London. It is kindly supported by the SOAS Centre for Gender Studies, with a contribution of £750. This money goes towards paying for lunches, printing posters, and paying for speakers who are in precarious employment circumstances. However, the Free School is completely autonomous; it is jointly organised by Jana Cattien and Rowan Powell, neither of whom are doing it in any institutional capacity. This is the second event of its kind; it follows the immense success of the first Free School in 2017. This year’s School will explore the following themes: Critical Race and Postcolonial Theory; Pop Feminisms; Critical Perspectives on Gender, Drag and Speculative Fiction; Feminisms from the Global South; Feminist Legal Theory; Queer of Colour Critique; and Posthuman Feminisms. Confirmed Speakers include: Nadje Al-Ali, Gina Heathcote, Rahul Rao, Emily Jones, Victoria Sin, Akanksha Mehta, Jin Haritaworn, Kate McNicholas-Smith, and Eddie Bruce-Jones. In order to keep the School free, we do not pay speakers who are in full-time, permanent employment. However, we understand that economic pressures affect speakers, as well as participants, and we will pay a flat rate of £100 per day to speakers who are in precarious employment situations and struggle to have their work financially recognised. This includes freelance artists and PhD students who do not have funding. Our intention is for speakers to attend an entire day, and to participate in the student-led workshops that take place in the afternoon. This is in order to facilitate non-hierarchical debate between participants and speakers. The organisers of this year’s Free School were participants in last year’s Free School. Likewise, the application panel for this year’s round will be made up of participants from last year’s round. At the end of the week, in summer 2018, we want to hand over to a few of this year’s participants. In this way, we want to go some way towards building a network for free feminist education. Places are free to all. Apply using the application form. Deadline for applications is 28 April 2018. Visit Free School of Critical Feminisms website for more info.